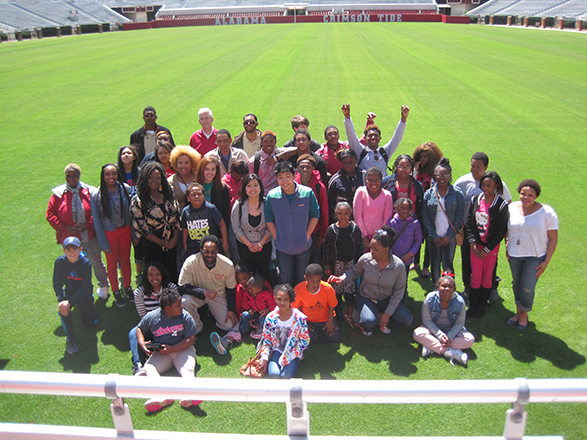 Victory Through Voices participants toured Bryant-Denny stadium during their visit to UA. From the July 2015 Desktop News | Nearly 50 elementary and junior high students from an inner-city after school program in Huntsville visited campus to participate in the “Victory Through Voices” oratorical contest. Julia Quan, a junior in New College, organized the event to encourage the students to go to college and pursue their dreams. Each contestant wrote a speech in response to the prompt: “As a young American, how can I contribute to the greatness of America?” They then presented their speeches on campus to a panel of judges, including faculty members, and received awards and certificates for participating. Quan said she has long dreamed of helping her community and empowering individuals to use their voice, and that dream became reality through the contest. While on campus, the students also experienced the Capstone firsthand. Before the competition began, they were given a bus tour of campus, served lunch at Lakeside Dining Hall and had the opportunity to explore Bryant-Denny Stadium where they were shown the Zone, the field and locker rooms. Quan says her favorite part of the event was seeing the awe and amazement in the students throughout the day. “I was so excited because this is what I have wanted to do for so long – get these kids to see that coming to college is possible if they continue to focus on their dreams,” she said. This was the first time that many of the students set foot on a college campus. After the contest, the students were talking about how excited they were about the college process and attending college themselves, Quan said. “The tours and oratorical contest were a life changing experience,” she said. The event was sponsored by New College and its director, Dr. Natalie Adams. Speech and debate competitors Debbie Lightfoot and her two sons, Jason and Benjamin, aided in timing, scoring and capturing the oratorical contest. Julia’s mom, Joanne, and brother, Joseph, assisted in preparing the students with their speeches in Huntsville and provided awards and certificates. Judges included University faculty and student recruitment staff.